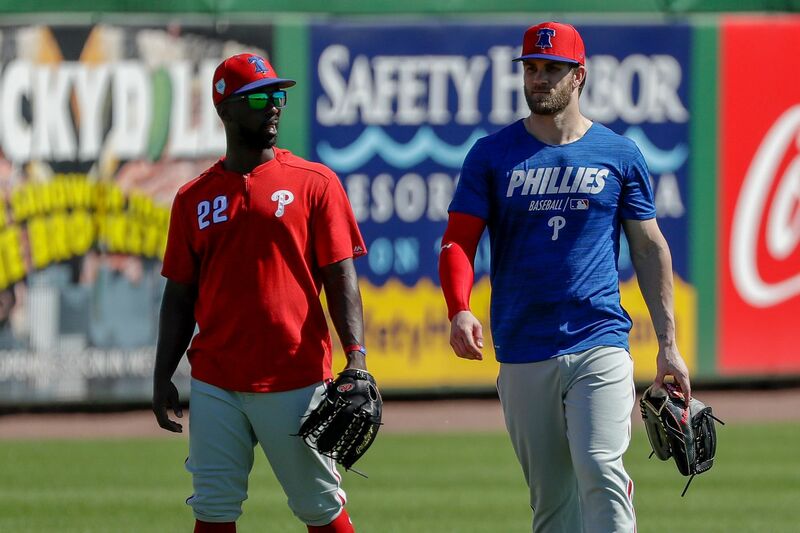 Phillies outfielders Bryce Harper and Andrew McCutchen walk in the outfield during practice on Sunday, March 3, 2019 at Spectrum Field in Clearwater, Fla.
CLEARWATER, Fla. — They’ve been called every name in the book, from the N-word on up. They’ve had their manhood attacked, their families disparaged. Once, a fan even mocked the death of a 2-day-old baby. The Phillies have heard it all. So, yes, they understand why Russell Westbrook snapped at a fan and his wife in Utah on March 11. Harper is a man’s man, always willing to push back. When the Utah fans told Westbrook to “get down on his knees, like he’s used to,” they knew all Westbrook could do was reply with threats to “bleep him up.” And his wife, too. Both were banned from Vivint Smart Home Arena for life, but the incident still infuriated Harper. Westbrook said as much, which cost him a $25,000 fine, but all athletes know any violent response will be met with harsher penalties than the fans receive. Few athletes are targeted like baseball outfielders and relievers. Some engage the hecklers, and some coaches act as a buffer, but the players generally try to ignore the jeers. When I asked a few Phillies about their worst experiences, they had some doozies. Quinn said that happened against the Mets at CitiField in the last week of the 2016 season, and the Westbrook incident brought back that memory. Quinn couldn’t identify that fan, so he didn’t report it. Maybe he should have. The next season, Orioles outfielder Adam Jones heard the same thing from Red Sox fans at Fenway Park, an incident that prompted Major League Baseball to review every team’s fan code of conduct. If what Quinn and Jones heard sounds bad, what Pat Neshek heard at Camden Yards in 2013, the season after tragedy struck his family, might have been worse. Neshek, 38, has pitched for seven teams in both leagues. He played for the Oakland A’s when that happened, though he knows the issues that come with the A’s visiting bullpen. So does 32-year-old Tommy Hunter, a reliever who also is playing for his seventh team and says he has had more than 100 hecklers ejected. “In Oakland, I had the entire first and second rows removed. It’s like the NBA; they’re close to you,” Hunter said. Apparently, the other side of the bay isn’t much better. Andrew McCutchen, a 10-year veteran, knows you might hear anything, anywhere, in any sport — especially when, like McCutchen, you’re the face of a franchise, as he was when he patrolled center field for the Pirates. And, if No. 42 could take it, McCutchen can. “Jackie Robinson was in this game. I can only imagine what he had to go through. I mean, who am I compared to him?” McCutchen said. "It’s never going to be perfect. A lot of people went through things so we wouldn’t have to, but it still exists. If he went through it, then I can handle some hecklers." Phillies Andrew McCutchen bats against the New York Yankees in a spring training game on Thursday, March 7, 2019 at Spectrum Field in Clearwater, Fla.
Hunter, a bodacious sort, often does. He and Neshek admitted that they have baited hecklers into using foul language to prompt an ejection. They appreciate bullpen coaches who were willing to take bullets for them, such as late Twins legend Rick Stelmaszek, or Craig Bjornson, who was with Neshek in Houston and now works for the Red Sox. Neshek said once, when Stelmaszek was bickering with an Indians heckler in 2006, Neshek crept over and doused the fan with a cup of water. Liquid annoyances are a two-way street, of course; pitchers know to watch for falling beers in Toronto. The visitors bullpen at Citizens Bank Park can be as bad as any, they said. When the Bank opened in 2004, the home team occupied the upper 'pen — for about one series. Phillies relievers complained that they were being heckled, so the team switched the 'pens. The team has been vigilant about the bullpen ever since, and they’ve always been protective of visiting players, such as Barry Bonds, J.D. Drew, and, yes, Bryce Harper. After the Adam Jones incident, MLB reviewed every team’s fan code of conduct. The Phillies didn’t need to alter theirs. DeAngelis said Phillies fans are quick to use the 10-year-old text-alert system to report belligerent behavior, and, unlike the Red Sox, they’ve never had to ban anyone for life — not even Sidney Smith, who threw a beer bottle at Phillies slugger Ryan Howard in 2016. DeAngelis and the players agree that the Adam Jones incident seems to have calmed behavior at ballparks to some degree, though Harper — a bat-flipping, hair-tossing superstar — still gets earfuls. Right? So, what’s the worst he’s heard? Sounds like it affects him. Once, on a hot day in Chicago a few years ago, McCutchen dealt with a particularly offensive fan in a most unusual way. Then, McCutchen, a five-time All-Star and the National League MVP in 2013, got down on his knees at Wrigley Field, and he prayed.